How to use the PARA. Hide 81 comments... Click to show. Ehi welcome back to fanup =D I'm here since the 6th December. Haha, even if I could, I wouldn't be allowed to ^.^. wee! You fanned me <3 I have 6 fans! There is a punishment. You get disqualified from the weeklyleaderboard. As of right now, Fan Coins are used only to buy things for your Avatar in the Avator shop. If you want to earn FanBucks, then you can either complete surveys or participate in contests. There are many contests going on right now, like the Avatar Costume Contest and the Halloween in San Para one. They are always fun! Don't hesitate to ask more questions! :). I cleaned out my Yoshy account tho. I'm sorry for misbehaving, my apologies for that. Pro, is this good? view my topic on my main account please. Hello, Could you please approve my 2 uploads? Hold on, There is no chance that any of my guides are stolen since I have made them myself. I've worked long on them and when I saw that this site came out I posted them on here. All of my content is not stole and is make 100% legal By me and my friend and brother. If you think I copied something please send me the site of where it is on, I made all of my content by my own and yes, I have posted it on a site and on facebook. I hope that you don't see this as any kind of copieing. Thanks. I received my prize for weekly leaderboards winners and the ESN code is says that is either invalid or has been used .. Can you help me sir? I am not really sure why that's happening. 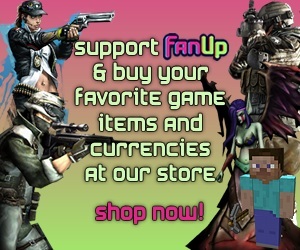 You should e-mail support@fanup.com. They will help you out. Sorry! can you get the sword? i doloaded stuff to get ore fanbucks and it only gave me half the things so i went to gamersfrist to try there and it gave me nothing for thir servays but 2 g1 credits lol..
tyvm for ur help im off for tonight! what dose fan coins? i got 275 and dont know where to spend them at..
As of right now, Fan Coins are used only to buy things for your Avatar in the Avator shop. If you want to buy things from the Marketplace, then you will need Fan Bucks. But don't worry, in the future, you will be able to use your Fan Coins for other things as well! Don't hesitate to ask any more questions! :). You can't do so much. Notjing to do with FanCoins for now. Not that I know of. Just be patient, he'll be online before you know it. When will the Winners of the Weekly Leaderboards be announced? They'll be announced as soon as Splooshi comes on. Don't worry, he'll be here soon, :). Yeah Congrats man! All the best, hope one day you make it to Master :)!! Check your badges, dude! And Congrats! The removal of g coin purchase via FanBucks was temporary. We had to work out a problem. congrats on the efangelist win! Pro in what? What do you mean? o.o. how about you,if i get 3rd i would be cool. iSaint is a different user than Rales. I've verified it end of story. Alright listen, you and everyone else here has to stop acussing others of being me. Hes a GOOD friend of mine that plays with me all the time, we have similar names in League of Legends and i asked him to join to help out with tips/content as he can post legit content and understands how to post it. As iv said before excellent content comes from the heart. Hey i goofed up when awarding you FanBucks, you should have them in your account now. Thanks man. I got 750 though. Is that ok? Lol. What the fish? I still didn't get mine?? Hey are you running this week too? I might run, not sure yet. Thanks but I'm not happy at all =/. Yah i can see why. I'll run again the week after this. due to the large number of copied guides i couldn't award you first or second place. however the stuff you posted even though it was copied, was modified fairly well and you did a great job making it look great for the site. I'm giving you third place. just know in the future i wont even be able to do that if guides arn't properly credited or overhauled. You seem pretty smart just write your own. I've started to write my own. But the problem is that I don't know what to write about. Everything that I want to write about is already posted by someone else. And there are only 3 games that I can write about by myself without copying. Hey man, i got some leads on you. What i mean is that we found some (if not all) your guides are copied/modified. I noticed a lot of people have been doing this since the new rule, which isn't good. Can you not do that? Cause i would hate to see someone of your status (Vet member) get disqualified for such non sense. if i can find a copy of the guide you posted by googling a sentence, then it wasn't modified enough. sorry but rules are rules. And not to be rude, but I try not to be like the other people who just copy and paste without even modifying a single word. Woah thanks for catching that, I must have been tired when I approved it. No worries. I'm always honest :D.
You posted all those guides in one day or what? And did you copy them or something? I'm just wondering, :D.
Sorry dude, missed you by a couple of mins. What's up? Do I know you from a game? Lol. Today I posted two guides. If both get approved, how many FanCoins will I get per each? Depends on the quality of the guides and if they were copied or t not! Ohh, I'll be honest here and say that I copied both :(. I'll try not to from next time. But please approve these two today, pleassse. :(. Sorry but no one gets special treatment around here. If you are allowed to submit one that is copied a week. The other one wont count as it seems you did it unintentionally. Oh, well thanks for replying. I deleted both of those guides anyways. Working on a new one right now, in my own words :).